Idealized portrait of Böhme's from Theosophia Revelata (1730). Jakob Böhme (also Boehme or Behme) (1575-1624) was a German Christian mystic whose writings about salvation and the nature of the cosmos influenced a number of later religious movements and philosophers, including the German Romantics. A shoemaker and a devout Lutheran, Böhme began to write after experiencing several visions. His ideas aroused opposition in the Lutheran church and he was forced to write in secret and later exiled for a year. Emphasizing personal faith and individual religious experience over adherence to dogma, he elaborated a new concept of the relationship between God and man. Böhme developed an explanation of how the conflict between divine wrath and divine love within the One God generated a creative impulse which gave rise to the multiplicity of the universe. He emphasized will as the prime motivating factor within God, and taught that God had given man the will to choose to seek divine grace. He also taught that the Fall of Man was a necessary stage in the evolution of the universe, saying that it was necessary for humanity to depart from God, through the rebellion of Satan, the separation of Eve from Adam, and their acquisition of the knowledge of good and evil, in order for creation to evolve to a new and more perfect state of redeemed harmony. Böhme’s ideas about the process of Creation, the primacy of will, the dialectic within God, the meaning of redemption and the importance of individual religious experience outraged the Lutheran church but influenced a number of modern thinkers, including Hegel, Schelling, Nietzsche, Heidegger, Carl Jung, Emmanuel Swedenborg, and George Fox (founder of the Quakers). Böhme was born in 1575 in Alt Seidenberg, near Görlitz, in Silesia on the Polish side of the Oder River, just across from eastern Germany. He grew up as a Lutheran, worked as a shoemaker in Görlitz, and married and had four children. He had little formal education, but undertook his own studies of the Scriptures, theology, the Kabbala, alchemy and the writings of Paracelsus. Böhme developed a following throughout Europe, where his followers were known as Behmenists. The English Behmenists later merged with the Society of Friends, who became known as "Quakers," and took their ideas to the New World. The central theme of Böhme’s thought was the relationship between the timeless unity of God and the multiplicity of the actual universe. Böhme suggested that God could have no knowledge of Himself except by revealing Himself through His creation. "In his depth," Boehme wrote, "God himself does not know what he is. For he knows no beginning, and also nothing like himself, and also no end. …" (Aurora, ch. 23). Self-revelation implied that there must be two entities, a subject (God) making the observation, and an object (the created world) being observed. Böhme developed a theory of creation based on the concept of a dialectic inherent in the nature of God, which resulted in a conflict between divine wrath and divine love. This struggle was necessary to stimulate the creation of the manifold universe. The essential Godhead (Ungrund), said Böhme, was eternally pure and free, but inherent in God was the will to go out of Himself and manifest Himself: "Here we remind the reader that God in Himself … has no more than one desire, which is to give and bring forth Himself." (Gnad. i, 18). The first product of God’s will to manifest Himself was a desire or longing, a primal darkness which obscured the purity of the original Godhead. Since this darkness contradicted the original will, a second will, the desire to return to the original state of unity while still holding onto desire, arose. The result was an introversion, a contraction into a core of being (Grund) which became the ground for all the further stages of creation. This unrequited desire of God for self-revelation became a divine wrath or bitterness (Grimmigkeit) which perpetually consumed itself and caused tremendous pain and anguish, the first suffering known to the universe. This, said Böhme, could be described as God the Father and generator of all things. When this divine wrath turned upon itself, it triumphed and became divine love, which Böhme described as God the Son. The interaction between divine wrath and divine love produced the creative impulse from which the universe evolved. Böhme identified the continual movement between the two as the Holy Spirit, or living breath of the cosmos. 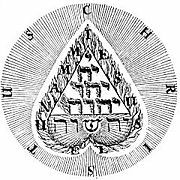 Böhme identified a fourth component of the Godhead, a preliminary to the creation of the sensible world, called "Virgin Wisdom" or Sophia, which could be described as a sort of mirror in which God could see images of His own potentiality before manifesting them in reality. Böhme taught that reality was a continual process of unity and division, and that all things consisted of positive and negative aspects. He also said that conflict and suffering were inevitable, even desirable, and that finite creatures could only become aware of themselves and God through struggle with negativity. If the natural life had no opposition (Widerwaertigkeit), and were without a goal, then it would never ask for its own ground, from which it came; then the hidden God would remain unknown to the natural life … there would be no sensation, nor will, nor activity, nor understanding." (SS, vol. 4, Weg zu Christo, "Von Goettlicher Beschaulichkeit," ch. 1, #9; cf. Way to Christ 196). Another chief concern of Böhme's writing was the nature of sin, evil, and redemption. According to Böhme the original Godhead was One, with a single will to reveal Himself in His creation. Evil was a rebellion of self-centeredness against the power of God. Consistent with Lutheran theology, Böhme preached that humanity had fallen from a state of divine grace to a state of sin and suffering, that the forces of evil included fallen angels who had rebelled against God, and that God's goal was to restore the world to a state of grace. Böhme appeared to depart from accepted theology (this was open to question due to his somewhat obscure, oracular style) in his description of the Fall as a necessary stage in the evolution of the universe. In Böhme's cosmology, it was necessary for all original unities to undergo differentiation, desire, and conflict. Therefore it was necessary for humanity to depart from God, through the rebellion of Satan, the separation of Eve from Adam, and their acquisition of the knowledge of good and evil, in order for creation to evolve to a new state of redeemed harmony. This new state would be more perfect than the original state of innocence, allowing God to achieve a new self-awareness by interacting with a creation that was both part of, and distinct from, Himself. Thus, free will was the most important gift God gave humanity, allowing man to seek divine grace as a deliberate choice. Böhme saw the incarnation of Christ not as a sacrificial offering to cancel out human sins, but as an offering of love for humanity, showing God's willingness to bear the suffering that had been a necessary aspect of creation. He also believed that the incarnation of Christ conveyed the message that a new state of harmony is possible. Böhme did not espouse the concept that sin pertained to the physical body, and that the physical body was in conflict with the spirit. Instead, he saw the body as “the spirit’s mother” and dwelling place, giving form and personality to the spirit. Böhme’s concept of redemption involved the restoration of man to a state of alignment with divine purpose. He emphasized the value of faith and self-awareness over strict adherence to scripture, and taught that each individual had a unique nature, saying, "As the many kinds of flowers grow in the earth near each other, and none contends with the other about color, smell, or taste, but they let the earth and the sun, rain and wind, heat and cold, do what they will with them, while they grow each according to its own nature, so it is with the children of God." 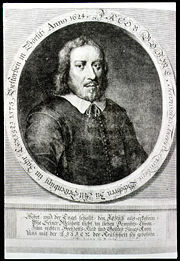 The very aspects of Böhme’s writings which seemed heretical and threatening to the Lutheran church were those which became a lasting influence and an inspiration to modern religious thinkers. As a mystic, Böhme did not base his ideas on strict logical reasoning, but on intuition and his personal religious experience. He presented his cosmology as a fusion of principles of psychology and alchemy. Böhme’s portrayal of the divine wrath and divine love of God imbued God with personality and guaranteed that man could experience a deeply personal awareness of God. His rejection of a narrow dogmatic interpretation of the Bible and emphasis on individual faith influenced later Protestant movements. Böhme’s explanation of the emergence of the physical world through the interaction between positive and negative principles within God has been further developed by modern theologians. The idea of successive stages in the process of creating the universe as a manifestation of God presaged modern process theology. Böhme’s emphasis on will, and the idea that God gave man the ability to seek divine grace as a deliberate choice, countered the strict determinism that dominated European theology for two centuries. Böhme’s thought influenced the ideas of the German Romantics, particularly G.W.F. Hegel, F. von Baader, and F.W.J. von Schelling; and indirectly affected the thought of Schopenhauer, Nietzsche, Hartmann, Bergson, and Heidegger. Paul Tillich, Martin Buber, and Carl Jung drew from his writings. Böhme was also an influence on mystics including Emmanuel Swedenborg and William Blake, George Fox (founder of the Quakers) and groups such as the Philadelphians and the Freemasons. He was highly regarded by Goethe and William Law. Bohme, Jakob; Waterfield, Robin, editor. Jacob Boehme. (Western Esoteric Masters Series) North Atlantic Books, 2001. Bohme, Jakob; Versluis, Arthur (Introduction). The Wisdom of Jacob Bohme. (Great Works of Christian Spirituality Series, Volume 2) New Grail Publishing, 2003. Merkel, Ingrid and A. G. Debus, (eds.) "Aurora; or, The Rising Sun of Allegory: Hermetic Imagery in the Work of Jakob Boehme." Hermeticism and the Renaissance: Intellectual History and the Occult in Early Modern Europe. Washington, DC: The Folger Shakespeare Library, 1988. 302-310. Stoudt, John Joesph. Sunrise to Eternity: A Study in Jacob Boehme's Life and Thought. Philadelphia: University of Pennsylvania Press, 1957. THE DAWN OF A NEW ERA. Gnostic Societies and Congregations. A Modern Gnostic from Paul Carus' History of the Devil (1900). www.sacred-texts.com. This page was last modified on 14 March 2018, at 20:42.